For cable variations, consult factory. Data cables for interfacing all Data-Linc Group modems and peripheral equipment to all types of PLCs and other devices are available. 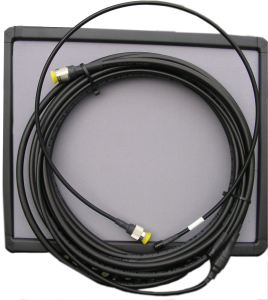 See the Data Cable Model Number Identifier and consult the factory at (425) 882-2206 or email sales@data-linc.com. A-O5B (download data sheet pdf 900MHz Omnidirectional Antenna, 12″L, 5.14dBi (3dBd) Gain, Mounting Brkt. A-O7B 900MHz Omnidirectional Antenna, 22″L, 7.14dBi (5dBd) Gain, Mounting Brkt. A-Y8B 900MHz Yagi Directional Antenna, 17.5″L, 8dBi Gain, 4 Element, Mounting Brkt. A-Y11B 900MHz Yagi Directional Antenna, 29.3″L, 11dBi Gain, 7 Element, Mounting Brkt. A-2.4-O5B 2.4GHz Omnidirectional Antenna, 5dBi Gain, Mounting Brkt. A-2.4-O6B 2.4GHz Omnidirectional Antenna (fiberglass), 6dBi Gain, Mounting Brkt. A-2.4-Y10B 2.4GHz Yagi Directional Antenna, 4.4″L, (enclosed), 10dBi Gain, 18″ Coax w/ Female “N”, Mounting Brkt. A-2.4-Y14B 2.4GHz Yagi Directional Antenna, 14″L, (enclosed), 14dBi Gain, 18″ Coax w/ Female “N”, Mounting Brkt. The LMR-240 (smaller coax) has a smaller bend radius and will cause less strain on the SMA connector of the radio. Additionally, only the smaller coax can take an SMA connector directly. It is possible to put an “N” connector on the LMR-400 (larger coax) and then use an N-to-SMA adapter, but this is not recommended. This scenario allows for slightly lower losses but requires very deliberate strain relief for the coax-to-radio connection. The attachment to the radio should always be made with a minimum length of LMR-240 (unless the customer has a very specific reason not to do so). US FCC regulations allow for a maximum Effective Rated Power (ERP) of 4W. Since the 900 MHz radio modules are capable of a maximum output of 1W, the entire transmission line including the antenna must have a total gain of no more than 6dB. 2.4 GHz systems must have a total transmission line and antenna gain of no more than 9dB. Data-Linc Group lists the specifications of its approved antennas in dBd, which means these figures may be plugged right in to the formula which follows. The total transmission line gain can be calculated simply by adding the gain of the antenna (dBd) and the losses of the feeder cable (coax), connection points (pairs of coax connectors) and surge protector (if used). Coax LMR-240 has losses of 7.6dB/100’ at 900 MHz, and 12.9dB/100’ at 2.4GHz. Coax LMR-400 has losses of 3.9dB/100’ at 900 MHz, and 6.8dB/100’ at 2.4GHz. Please note that LMR-400 has nearly half the losses of LMR-240 in both frequency bands. At distances over about 25’ power losses can be reduced by using a 3’ stub of LMR-240 with an “N” connector on the antenna end, in combination with the desired length ofLMR-240. The savings in power dissipation make it worth the small losses in the additional connector pair. The total transmission line gain then equals G – L – .48(C) where “G” is the gain of the antenna in dBd. “L” is the total loss in the coax itself, found by multiplying the appropriate specification listed above by the number of feet of coax. And, C is the number of coax connector pairs (or connection points) in the entire transmission line. The maximum allowable transmission line gain is 6dB for 900MHz units, and 9dB for 2.4GHz units, assuming the radios are set for maximum transmit power. Data-Linc Group does not authorize the sale of systems capable of exceeding these specifications to any customer.